The San Juan Islands map below pinpoints the towns of the four main islands: San Juan, Orcas, Lopez and Shaw and shows the approximate locations of many of the numerous smaller islands that make up the San Juan Islands group. The San Juan Islands Group consists of 172 named islands of the more than 700 islands, islets and reefs identified at low tide and more than 400 at high tide. Additionally, the map shows the roads that connect the various communities and reach various points of interest on each of the four major islands. 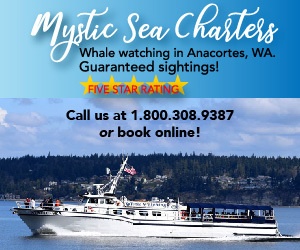 Also seen on the San Juan Island map are numerous points of interest including state and national parks, wildlife refuges and interpretive areas. 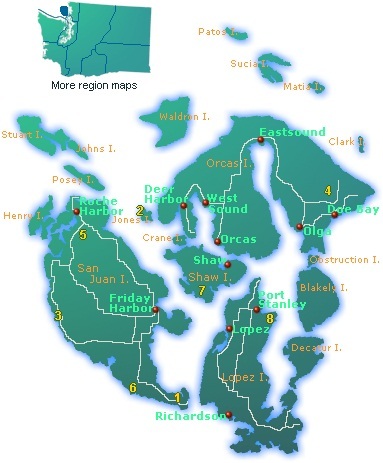 The small inset map shows the location of the San Juan Islands in relation to the various other travel regions of Washington.